Just got sent the BMi report for the end of 2010. South Africa rate in the bottom 100 when it comes to coffee consumption world wide. But as South Africans it is interesting looking at the current data. The mixed coffee variants include an element of chicory within the composition, In more recent years there seems to have been more consumer shifting within the coffee category itself, with conversion from instant to ground coffee variants as palates become more sophisticated. These figures may be over a year old, but they are the most recent we have. Mixed instant coffee continues to dominate the total market in volume terms. 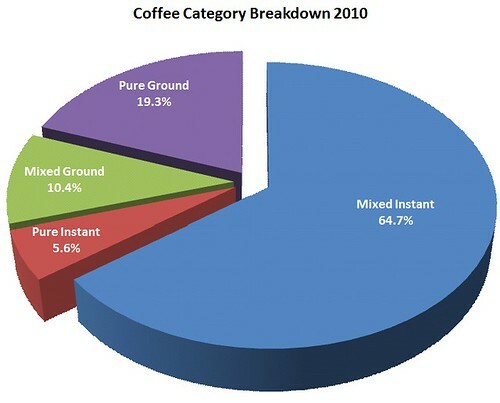 The substantial 64.7% volume share that it commanded for 2010 meant that the 2.5% annual growth seen for the category automatically put the coffee market growth into the black. Furthermore, positive performances by both mixed instant and pure ground coffee served to bolster the base line growth already achieved. The mixed instant volumes saw only limited growth during 2010 with this category experiencing significant price increases in the last two quarters as it is believed that producers attempted recover sales late in the year. In terms of the mixed ground category, there was good growth of 7.0% for the year. Price increases slowed as less established players lowered their sales prices in order to compete with the larger producers. One category recorded a volume drop during the base year; pure instant coffee. It is believed that there was a level of traffic to pure ground from pure instant variants as consumers explored competing products. This movement may have been encouraged by the value proposition offered by pure ground coffee as tremendous price increases were recorded for pure instant. Pure ground coffee noted tremendous growth in volumes in 2010, particularly on the wholesale front. A flood of imported beans and packaged ground coffee bolstered South African volumes by 17.8%, this being the single largest growth percentage recorded historically throughout the analysis. The retail trade remains the single largest consumer of coffee with more than half of the market volumes being channelled through this sector. The regional consumption of coffee is skewed to the Western Cape and Gauteng, being metropolitan areas. The coffee market is expected to show limited growth in the short term. Increases of 2.9% and 2.8% are anticipated for 2011 and 2012 respectively.